For a number of years, Florida has topped lists as either the most dangerous or one of the most dangerous places to ride a motorcycle – and yet people still do it and enjoy it. There are multiple factors that appeal to bikers in the state – but in order to help minimize your risk of becoming a statistic, know that there are things you may be able to do to protect yourself. Data from the National Highway Traffic Safety Administration (NHTSA) shows that Florida had the highest number of motorcycle fatalities in the nation in 2016 (the most recent available data year), with 555, while the nationwide number continued to rise, topping 5,200 after several years under the 5,000 mark. Only California had a comparable number of motorcyclist fatalities, with 529; the next highest after that number was Texas with 458 but after that, the next highest is Ohio with 178. The proverbial jury is out on why the numbers in Florida are so high. Some blame the sheer number of bikers who call Florida home, since the weather permits riding for longer than it might elsewhere. 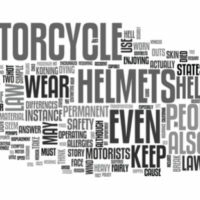 Others blame the helmet laws – as of this writing, Florida’s helmet law does not absolutely require headgear for most adult riders of motorcycles and mopeds, and some argue that a failure to mandate such protective wear adds to the fatality count. Still others place blame on distracted motorists, whether they drive autos, trucks or other bikes. Either way, it is plain that the chance to be a motorcycle fatality is worryingly high in the Sunshine State. One of the most important things that you need to be aware of if you are in a Florida motorcycle accident is that the personal injury protection (PIP) insurance you are required to carry as an automobile driver does not cover injuries and medical bills from motorcycle accidents. A separate policy is necessary to be sure you are covered for bike crashes – most auto insurance policies cover only four-wheeled vehicles, and also, motorcycle crashes are simply too dangerous for most insurers’ liking, given that the risk of death in a motorcycle crash is approximately 29 times higher than the risk of death if you are the driver or passenger in an automobile. Many people love motorcycles, but at the same time, it is important to be aware of their potential risks. If you are injured in a motorcycle accident, calling an attorney who has experience with these cases can be the difference between receiving compensation and going without. The Orlando motorcycle accident lawyers at the Hornsby Law Group are happy to try and help you decide how best to proceed with your claim. Call our office today to set up an initial appointment.